When you think of Japan, you’re often struck by two completely different images – the frenetic lights and sounds of Tokyo’s tech-hub, and the peace and tranquillity of tea-houses in the countryside. Now both those ideas come to life in the Lucky Koi slot at Lucky Nugget Casino: a game that combines the bliss of nature with the buzz of online slots! Lucky Koi is themed around the relaxing koi ponds, which have been popularised the world thanks to their beauty and relaxing nature. The slot machine has five reels, each of which shows three symbols, and there are 25 different paylines on offer – which means 25 ways to win! All the symbols on the reels are in keeping with the koi pond theme – you can find dragonflies, water lilies and cute turtles hanging out on the surface of the pond. Other symbols keep up the strong atmosphere, such as the gold and silver teapots (each with their appropriate kanji on), and the red fan which has the Japanese character for “gold” or “money” written on it. But if you get lucky, the beautiful fishes might swim up and give you a treat. Golden koi carp are wild symbols, so you’ll be on the look-out for them: one is marked Wild, while the other is marked Lucky Koi. Wild Lucky Koi will substitute all the other symbols except Scatter, and it’s a great way to match more symbols and up your payouts. The Scatter symbol is a blissful zen garden, complete with sakura (cherry blossoms) and stone lantern. If two or more of these appear across the reels, then you’ll be assured an instant payout. And if three Scatter symbols appear, you’ll be blessed with good fortune. Three Scatter symbols turning up on the reels triggers the bonus game, as is standard for Microgaming’s online slot machines. But Lucky Koi has a twist: you get your pick of two different reward games. 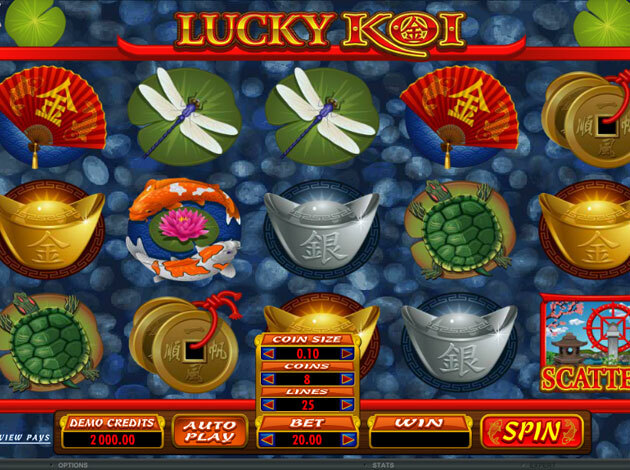 The first bonus game is the standard one, giving you Free Spins to spend on playing more rounds of Lucky Koi. You’ll be given a predetermined number of free spins – from 10 to 30 – as well as a multiplier up to 5x. This is the best way to increase your winnings and keep those payouts rising! The other choice is unique to Lucky Koi, and is the Koi Bonus Feature. You’ll be handed a bamboo fishing pole, and invited to try your hand at catching three to six fish from the pond. Each koi carp will either give you additional catches, or a nice bonus prize. Like our other online slots, you can choose the coin size, line and bet, or even go with the auto-play mode for a more relaxed approach. With a jackpot that tops out at 10,000 coins, Lucky Koi is a great slot machine for those looking to experience a more relaxed pace of life without missing out on any of the fun. With beautiful graphics and quirky bonuses, this slot is one of our favourites. We wish you all the best of luck – or, as they say in Japan, ganbatte!